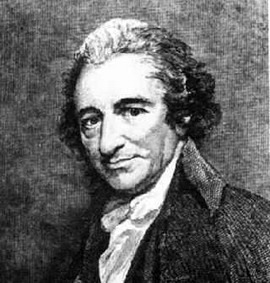 Thomas Paine, the author of Common Sense, which is credited with being the catalyst for the American Revolution, is considered to be a hero of secularists because he was a skeptic of the Bible. He was a deist, so he believed in God, but he didn’t believe that God was active in history. To deists, Jesus was merely a good teacher or a role model, not the Lamb of God who redeemed mankind from their sins, and parts of the Bible were thought to be the creation of man. Even so, Paine often used the Bible in his arguments. In Common Sense he comforted those who believed in the Bible by explaining that even God never meant for kings to rule over men. Referring to the story of Saul, he explained, “That the Almighty hath here entered his protest against monarchial government is true, or the scripture is false.” He then goes on to explain that God didn’t want them to have a king because the king would use the people to gain luxury for himself, to impose a tax which would become burdensome, and would use and abuse their sons and daughters for his own purposes. He explained, just as Samuel Rutherford (the Presbyterian) did, that the Law should be King (Lex Rex) rather than the King being the Law (Rex Lex). Paine also used the Scripture to defend the abolition of slavery. Because Paine was a deist, he was a supporter of gradual emancipation. In 1780, as an Assembly Clerk, he wrote the “Pennsylvania Act for the Gradual Emancipation of Slavery.” But Paine’s deism didn’t mean he abandoned the Scriptures. In American Slavery in America, Paine appealed to the American people by reminding them that God was the Lord of all (a reference to Acts 17:26) and that Jesus commanded them to love their neighbor. He also said it was wrong to use the Scriptures to justify slavery and that it was a perversion of their purpose. But then, Paine travelled to Europe to help the French in their revolution. It was here that he wrote The Age of Reason. Whereas his previous writings showed honor to the Scriptures, this new writing mocked them. This gave America a stability and wisdom that could never be known by those who were merely rebelling against the abuses of the ancien regime of church and monarchy. As a result of watching the impact of the France’s total rejection of God, Americans decided that the better way was the way of grace and love–reject clerical abuses, but don’t reject Jesus. After the French Revolution, Paine represented the extreme denial of God and his Word—and Americans saw that it led to the guillotine, so they rejected him. It was Paine’s use of the Bible, in conjunction with reason, which led to his greatest successes, but his rejection of the Bible would ultimately lead to his failure. Previous Were Christians Responsible for the Inquisition?